Sta nevicando in Les Contamines ?Grazie! Light rain (totale 3.0mm), mostly falling Venerdì pomeriggio. Very mild (max 15°C Sabato pomeriggio, min 4°C Domenica notte). Wind will be generally light. Moderate rain (totale 13.0mm), heaviest Mercoledì notte. Very mild (max 15°C Martedì pomeriggio, min 5°C Martedì notte). Wind will be generally light. La tabella sopra da le previsioni meteo per Les Contamines a specifiche altezze 1176 m. I nostri sofisticati modelli meteo ci consentono di fornire previsioni neve per la vetta, l'area intermedia e a valle delle stazioni sciistiche di Les Contamines. Per accedere alle previsioni meteo ad altre altezze, per spostarti usa tab sopra la tabella. Per una visione meteo piu' ampia , controlla la mappa meteo di France. 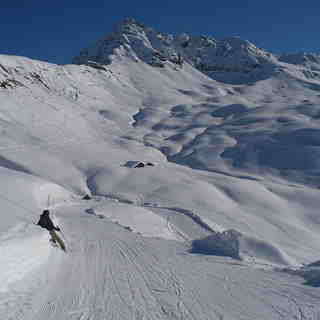 I have now spent 4 winter seasons in Les Contamines. 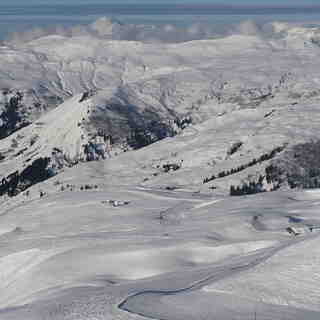 It is a great place if you want to enjoy fresh powder. You can find some awesome runs without even having to hike your legs of. Of course, if you do like to climb for an hour or so, I can guarantee that you will find runs that are absolutely incredible. A large part of the resort faces north and the valley is known for getting big amounts of snow, so the chances of you getting some powpow are fairly high. If you prefer sticking to the groomed terrain, you won't be disappointed neither. Both challenging and more mellow slopes are there to be shreded. The resort does require some discovering, even after 4 years I keep on finding new spots which always blow my mind. Try to go there when you have some fresh snow, as you might have guessed by now, the free-riding is simply awesome.